Dutch container terminal operating company APM Terminals has inaugurated its first state-of-the-art cold storage warehouse in India, the firm announced today (18 April). 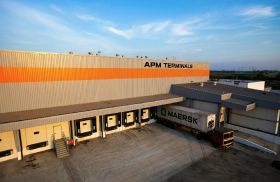 The facility, located in Ponneri - a Chennai suburb, officially opened on 12 April and will ensure reliable and stable transport of cargo, including goods such as fish, fruits, medicines, and specialty chemicals, APM Terminals said in a press release. The facilities will provide refrigerated container plug-in facilities for cold warehousing, with services ranging from customs examination and clearance under controlled temperature,value-added services like palletization and packaging, on-wheel customs seal verification, and bonded cargo movement to different seaports and airports. The services are available for both domestic and international import/export customers, the firm said. "Spread over 10,000m2, the cold chain solutions facility is the first of its kind in South India as it is integrated with APM Terminals’ container freight station," an APM Terminals spokesman said. "The facility will offer customs clearance facilitation and proximity to the ports of Chennai, Ennore, Kattupalli and Krishnapattnam, with round the clock accessibility. An additional cold chain solutions facility for domestic use has been built in close proximity to the container freight station." The facilities were inaugurated by M Ajit Kumar, chief commissioner of customs, Chennai Zone in the presence of Dries van Dongen, global head of inland services for APM Terminals, officials from different government offices, and key customers during a ceremony on 12 April.